Went to Indonesia with the RSYC. Most people at the RSYC went there to sightsee, but we went there to play with fishes. 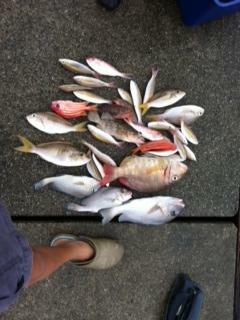 After the days and nights of sea sickness and tiredness, here is the overall catch. btw,the emperor was 1kg. I guess fishing never leaves our mind wherever there is water. Did you guys organize the fishing separately from the RSYC's program? It's nice to see some catches from our neighbouring waters, thanks for sharing it with us.